Encore D/C makes core buildup easier and better. Encore D/C makes core buildup easier and better. Encore D/C is a dual-cure composite core buildup material that enables you to build up just the coronal core or to fabricate a composite post and core that bonds the post, tooth and core together into an integrated whole. Deliver Encore D/C direct to the bottom of the post hole with our exclusive needle tip. Light-cure for 20 seconds to accelerate the setting and Encore D/C’s exclusive dual-cure mode will complete the full cure. Encore D/C dual-cure formula speeds up your procedures and ensures complete cure of all material, regardless of depth or placement of the final restoration. The non-slumping formula eliminates the need to use a matrix/core-form. Light-activated to accelerate the set. Made in the USA. Encore® D/C MiniMix®: Our most popular format, the MiniMix .5mL unit-dose technology eliminates waste and cross-contamination concerns. 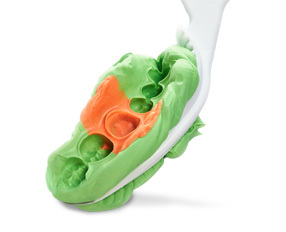 The smaller size is more easily maneuvered in the mouth, while the longer mixing tip enables easy application down canals in second and third molars. MiniMix is also patient-friendly; the small format is less threatening and more comfortable for sensitive patients. Encore® D/C Automix: The automix cartridge is our standard format and widely used. Encore® D/C MiniMix® Kit Contains: Kits include single-dose .5mL cartridges (12 or 36) and Mixing Nozzles (24 or 72). Does Encore D/C Automix contain fluoride? What automix syringe do I need to use with Encore DC? You need a 1:1 DS-25, or 25ml automix syringe. Does Encore D/C MiniMix contain fluoride? Do you sell MiniMix mixing nozzles separately? How many doses does one Encore D/C MiniMix provide? On average two. We provide two mixing nozzles for each MiniMix. Isolate the tooth to be prepared. We recommend the use of a rubber dam or cotton rolls. Remove all existing restorations and decay from the tooth. At this time you may place any pins or posts if necessary. Acid etch the entire preparation for 20 seconds using (32% to 40%) phosphoric acid. We recommend the use of Centrix Onyx 40% phosphoric etch gel. Rinse with a water spray for 30 seconds and lightly air dry. The enamel of the preparation should have a frosted appearance. Place bonding system of your choice onto the preparation, according to the manufacture's instructions. When placing the primer, be sure that all of the solvent has been evaporated and the preparation has a glossy appearance. Before light curing, the bonding agent should be thinned with a light air spray. Select the desired shade of ENCORE D/C AUTOMIX core buildup material and place the appropriate cartridge into the Type S25 Applicator Gun. Natural Shade (A2) for use under ceramic crowns. Contrast Shade (blue) to distinguish core material from tooth structure. Remove the cap from the cartridge and attach a new mixing nozzle. If desired, an Intra Oral tip (Centrix Access II Intraoral Needletip REF 290025) may be snapped into the open end of the mixing nozzle and inserted into the open root canal. The cap should remain on the cartridge until ready for use! When using a cartridge for the first time, express a "pea" size amount of material and discard! Place the Intra-Oral tip at the base of the preparation and inject from the bottom up. Keep tip embedded in the material to avoid air entrapment. Fill as needed to complete the restoration. To facilitate placement, a matrix band may be placed around the prepared tooth. Place the mixing tip directly into the preparation and squeeze the trigger of the applicator gun to express the paste. If a matrix band was used, test with an explorer to insure that material has set prior to removal. Once set, cut and finish the preparation, using water-cooled diamonds or burs. When using a prefabricated crown form, place the mixing tip directly into the crown form and squeeze the trigger of the cartridge to express the paste. Place the loaded crown form onto the prepared tooth and hold into place until the paste is fully set. ENCORED/C AUTOMIX core build up paste has a 1:30 minute working time. The material may be manipulated using a composite instrument. A flat-ended interproximal carver (IPC) is recommended. ENCORED/C AUTOMIX core build up paste has a 5 minute chemical cure set time (no light curing). ENCORED/C AUTOMIX core build up paste may be light cured with a standard dental halogen lamp for 40 seconds (4mm max.). A thin layer (<2mm) will need only 20 second light cure. If a matrix band was used, test with an explorer to insure that material has set prior to its removal. Once set, cut and finish the preparation, water-cooled diamonds or burs. If pulp is exposed, use a suitable liner. Contact with skin and eyes should be avoided. If accidental contact occurs, rinse immediately with plenty of water and consult a physician if necessary. Do not use with materials containing eugenol. This could inhibit polymerization. Water and oily air must be avoided, as they inhibit polymerization at the contact area. Avoid contact with gingival tissue and adjacent teeth. Placement of any composite is contra indicated if a dry field is not possible. Do not use ENCORED/C AUTOMIX core build up paste for direct application on dentin near the pulp or if the pulp chamber has been exposed. There are no known systemic side effects to date, however, do not use in patients with known sensitivities to Bis-GMA, benzoyl peroxide or composite resin materials. Acid etch the entire preparation for 20 seconds using (32% to 40%) phosphoric acid. We recommend the use of Centrix Onyx™ 40% phosphoric etch gel. Rinse with a water spray for 30 seconds and lightly air dry. The enamel of the preparation should have a frosted appearance. Place bonding system of your choice onto the preparation, according to the manufacturer's instructions. Do not use one bottle bonding systems. When placing the primer, be sure that all of the solvent has been evaporated and the preparation has a glossy appearance. Before light curing, the bonding agent should be thinned with a light air spray. Insert Encore D/C Mini-Mix cartridge into a Centrix Snap-Fit™ Syringe. Remove cap from MiniMix cartridge and attach mixing nozzle. Purge a small amount from the tip to assure proper mixing and flow. Inject the material into the prep, keeping the needle at the bottom of the prep to reduce the chance of voids, fill from the bottom up. Place the mixing tip directly into the crown form and squeeze the trigger of the cartridge to express the paste. Place the loaded crown form onto the prepared tooth and hold into place until the paste is fully set. Encore D/C MiniMix core buildup paste has a 1:30 minute working time. The material may be manipulated using a composite instrument. A flat-ended interproximal carver (IPC) is recommended. Light activate with a standard dental halogen lamp or LED curing unit for 40 seconds (per 4mm layer). A thinner layer (<2mm) will need only a 20 second light exposure. To complete the chemical cure activation, wait 5 minutes before cutting and finishing the prep. If a matrix band was used, test with an explorer to insure that material has set prior to its removal. Once set, cut and finish the preparation, using water-cooled diamonds or burs. Water and oil-contaminated air must be avoided, as they inhibit polymerization at the contact area. Placement of any composite is contraindicated if a dry field is not possible. Do not use Encore D/C MiniMix core buildup paste for direct application on dentin near the pulp or if the pulp chamber has been exposed. Encore D/C MiniMix is truly non-slumping!